I love the fall season. The air is crisp, leaves are changing colour, and the use of excess amounts of cinnamon becomes acceptable again. And then there is Thanksgiving. The tryptophan coma-inducing holiday where stretchy pants are the only pants required at the dinner table. I love decorating for fall and Thanksgiving. This year I decided that I would make a Thanksgiving themed bunting to hang in my house for the season. Bunting is a super easy and quick project to do. If you are a beginner sewer and are learning the tricks of the machine still, The Makehouse offers a class here in Victoria called Learn to Sew Bunting (next one coming up on December 1st just in time for the winter holidays!) which is an awesome workshop for learning beginner sewing techniques and you get to take home something fun to hang in your home or to use as a decoration for the holidays. Below, is my step by step process for making Thanksgiving themed bunting. I was going for a Thanksgiving pie themed look. 1. Find your fabric. I used quilting weight cotton. You don't need much at all. Scraps are perfect for this kind of project. I bought a half a meter of the cross hatch patterned fabric and found the yellow pie crust looking fabric in the remnant section of my local fabric store. It is handy to have a long piece of fabric to cut and iron for the connecting strip, otherwise, you don't need to buy more than a quarter of a metre unless you are planning to make a very long bunting. 2. Cut your pieces. I created a triangle pattern that measured 5 inches in width and 7 inches in length allowing for a 1/2 inch seam. I wanted to make 12 bunting triangles, so I cut 24 pieces to pin together. I measured a long rectangle to connect the 12 triangles together as 2 inches wide by 68 inches long. 3. Iron everything. First I started by ironing my long rectangle piece by folding it in half width-wise (so that it is an even skinnier long rectangle). Then I opened it back up to fold in the edges 1/2 an inch toward the centre crease of the fabric. Then I folded it in half again so that the strip of fabric was a 1/2 inch wide and 68 inches long. Next, I ironed all of my triangle pieces so that they were easy to pin together. 4. Pin and sew. First I pinned each of my triangles together with the good sides facing each other. Then it was time to sew! I used a straight stitch and a half inch seam, and sewed from the wide part of the triangle to the tip, stopped with my needle in the fabric, and turned the fabric to sew up the other side without my fabric leaving the machine. Alternatively, you could sew down either end until the seams cross at the tip of the triangle. Both methods work, just your preference that matters! 5. Turn right side out and iron again. 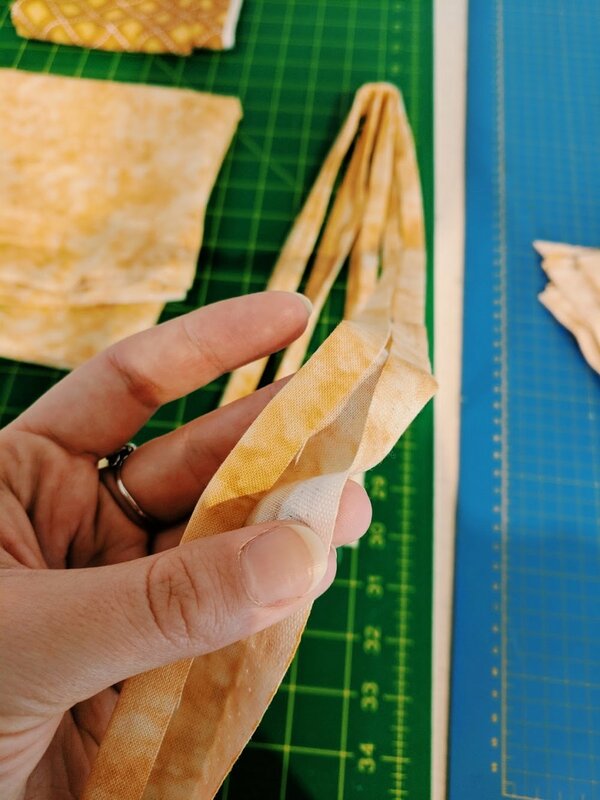 Once all 12 of your triangle bunting pieces are sewn, you can turn them right side out and press them into shape. 6. Arrange your bunting! The fun part! Arrange your bunting triangles so that the top open part of your bunting triangles are hidden by aligning them with the centre fold of your long rectangle bunting strip. Then pin in place and get ready to sew it all together! I used clips for this part which I liked a lot more than pins. I found that they were easier for me to keep the bunting triangles in place and ensure they wouldn't move. 7. Sew it all together. Now that everything is clipped in place it is time to sew! I used a wide zig zag stitch to sew the pieces together and removed the clips as I went. It is important to make sure that the 1/2 inch rectangular piece holding all your bunting triangles together is aligned in the centre of your sewing machine so that every piece is securely attached and you have a nice finished looking item. For an even nicer finish, I folded over the edges of the long rectangle about 1/2 an inch while attaching the triangles so that I didn't have a raw edge at the end of the bunting. 8. Hang it up! You now have lovely fun and festive bunting! For this post, I had the bunting hanging on the wall. At the moment I have it hanging above my kitchen counter. You could also use it to dress up a table or hang it above your bed! Bunting for all!